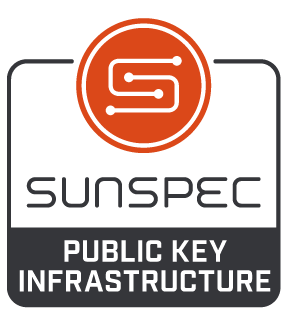 The SunSpec Certified Public Key Infrastructure (PKI) program is designed to increase stakeholder confidence in Distributed Energy Resource (DER) communication solutions, including those enabling interoperability of smart inverters, smart PV modules, EV charging, and energy storage. Public Key Infrastructure is the preferred method of authentication for networked ecosystems due to its strength and scalability. In addition, advances in the hardware and semiconductor industries have allowed for strong authentication using Elliptic Curve Cryptography (ECC) and PKI to be implemented in small devices very economically. PKI is designated as the method of authentication used for Institute of Electrical and Electronics Engineers Standard (IEEE Std.) 2030.5 and is therefore the method to be used for authenticating and securing communications for SunSpec Certified™ products and services. Thus, the program’s initial focus is to fulfill California Rule 21 compliance. The program will then address the rollout of IEEE 1547™-2018. IEEE 1547 establishes uniform requirements for interconnection of DERs, such as photovoltaics and battery systems, with the electric power system. Hardware and software products that implement client, aggregator and server requirements spelled out by IEEE 2030.5-2018 and CSIP. SunSpec certification is required in order to use PKI services.